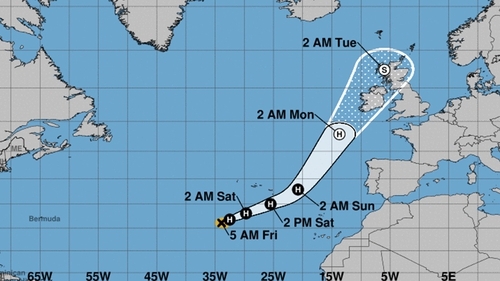 School buses operated by Bus Éireann in Cork, Kerry, Clare, Mayo and Galway will not run on Monday due to the expected arrival of the remains of Hurricane Ophelia. A status red weather warning has been issued by Met Éireann for a number of counties on the western seaboard for Monday. "Parents, schools and school management bodies have previously been advised of this policy - adopted in 2015 - to ensure school children are not endangered in any way," said Bus Éireann in a statement. Bus Éireann contacted parents, school management bodies and school transport contractors by email yesterday to inform them of the decision to cancel some services. "This decision is guided by Met Éireann's status red weather warning, which advises that 'action is taken' to protect against the possible effects of severe weather," said Bus Éireann. Up to 116,000 school children use Bus Éireann's School Transport Scheme daily. Bus Éireann said these children "make their way to pick up points to board the bus, on minor roads, and could therefore be exposed to severe elements". "Bus Éireann want to eliminate any risk this might result in." The remains of Hurricane Ophelia is expected to bring mean wind speeds in excess of 80km/h and gusts of up to 130km/h to counties Mayo, Galway, Clare, Kerry and Cork. A status orange warning is in place for the rest of the country, with mean wind speeds of between 65-80km/h expected, and gusts of between 110-130km/h. Winds may not be as strong in inland areas. Both warnings come into effect from 9am on Monday morning. Met Éireann have warned of potential structural damage and flooding as a result of the storm. However, they say there is still a high degree of uncertainty regarding the exact track and evolution of the storm.